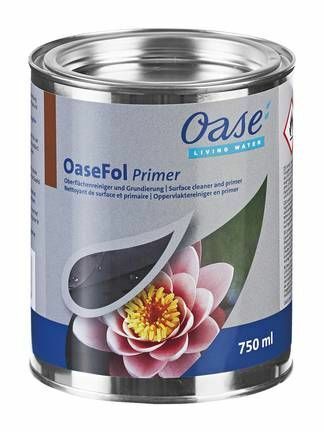 Repair damage to your pond liner with OaseFol Extra large pond repair patch for all rubber pond liners. Measuring 180mm x 230mm (7 inches by 9 inches) this self adhesive patch will repair and strengthen liner damage. We recommend a primer is used before applying repair patch. Use primer to thoroughly cleans surface to be bonded ensures a waterproof bond. Patch may be cut to suit smaller leaks as required. 750ml Primer for joining liner and patching repairs.